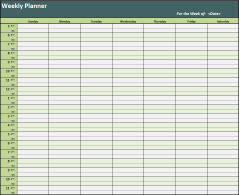 This FREE Weekly Planner Spreadsheet can be used as an electronic scheduler, or printed for display purposes. The Planner features all days of the week and allows for plannnig from 5:00am to 11:30pm. Enter appointments, reminders, birthdays, meetings, etc. The print area on the spreadsheet is pre-set, so you can easily print the Planner to carry with you. Never miss an important appointment again! © 2019 practicalspreadsheets.com - All rights reserved.